The Caliber is a roomy 5-door hatchback powered by a variety of 4-cylinder engines with optional AWD. The wild and crazy Dodge SRT4 has been replaced by the even more powerful Caliber SRT4. Power from the 2.4L turbo has been boosted to 280-bhp, with 265-lb.-ft. of available torque. All the horsepower is funneled through the front wheels, via a 6-speed manual and a limited-slip differential. Dodge claims 0-60 mph in less than 6 seconds. Unlike other competitors, the SRT4 is equipped with standard 19-inch alloy wheels and P255/45R19 tires. Interior upgrades include aluminum pedal pads, and a simulated carbon-fiber steering wheel rim. An optional 13-speaker Kicker audio system has 322-watts, plus a 100-watt subwoofer. Although the SRT4 has more power than other compact performance cars, the FWD layout puts it at a disadvantage compared to its more expensive AWD competitors. 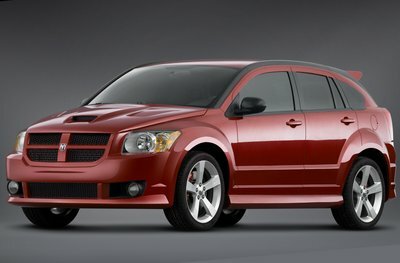 Although it was first shown in 2006, the wild Caliber SRT4 finally joins the lineup for the 2008 model year.